Grab your stethoscope and head to the LEGO City 60204 City Hospital, where heroes are needed every day! This amazing set features a hospital building with reception area, kiosk and ambulance drop-off, vision testing room with eye chart, x-ray room with a light brick function, plus an operating/delivery room. It's also modular, so you can configure it in different ways. This cool set also includes an ambulance with opening back door and space for a stretcher, a helicopter with spinning rotors and storage box, and a separate buildable helipad. Includes 11 LEGO mini-figures, plus skeleton and baby figures. 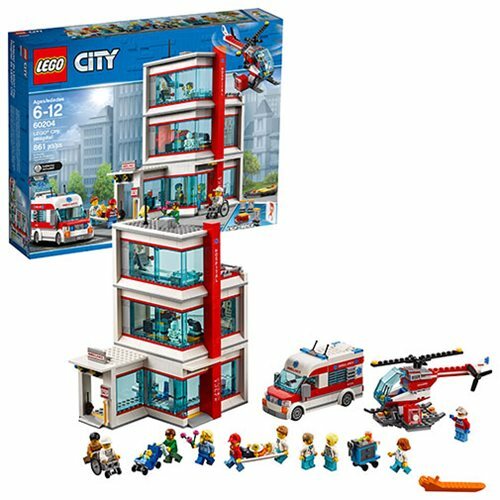 The LEGO City 60204 LEGO City Hospital includes 861 pieces.